Ontario Premier Doug Ford revved up his rhetoric about carbon taxes Wednesday, claiming without evidence that his government would protect the public from rising prices. Ford delivered the partisan message at a staged event in a suburban community west of the Greater Toronto Area, launching into a full-frontal assault on the federal government’s efforts to reduce greenhouse gas emissions, without acknowledging the science underpinning global efforts to stabilize the planet’s atmosphere and prevent dangerous climate change. Instead, Ford portrayed Prime Minister Justin Trudeau’s government as a job-killing machine intent on pushing prices up and his provincial government as protector of working Ontarians in remarks at a trucking facility in Cambridge, adding that a price on pollution was incompatible with keeping well-paying trucking and manufacturing jobs in the province. And they’re concerned about the inaction on this front. World leaders only have 11 more years to avoid disastrous levels of global warming, according to a 2018 report from the UN Intergovernmental Panel on Climate Change (IPCC). What they want: The common demand among students, although they vary country-to-country, is for the reduction of greenhouse gas emissions. March 15, the Ides of March. Hundreds of thousands of youth and allies are in the streets, marching for a healthier planet: the pictures bring tears to my eyes. There is a sense of a diagnosis being made, en masse. The children of the world have shunned the system created by adults—the schools, as being inadequate to the moment. They are looking into each other’s eyes, confirming that climate change is an existential threat to their health and well-being, and that their elders have failed to protect them. The leadership of adults is being questioned on an unprecedented global scale. That has been stripped away. The scale of the climate crisis and the threat it poses to human life has just been made clear in the starkest possible terms by youthful truth-tellers. Twelve-year-old Roy Bateman already knows what he’d say if he met Ontario Premier Doug Ford. Batemen was one of thousands of Canadian students striking Friday with a global call for action on climate change. 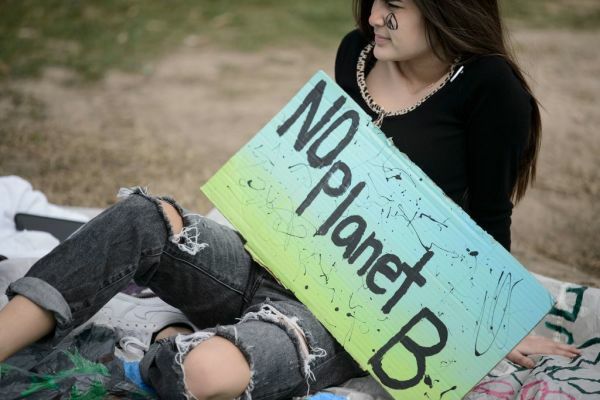 They join thousands of their peers in more than 100 countries, led by the now Nobel Peace Prize-nominated Greta Thunberg. The truth is this: We’re closer to 100 percent renewable energy today than we were to the moon in 1961, when President Kennedy made his famous pledge to land there by the end of the decade. Here’s another truth: It’s not going to be pretty. We have unleashed powerful climactic forces that can’t just be shut off like a dirty, obsolete coal plant. Every day those forces are intensifying and interacting in ways that profoundly affect people right now. We can no longer afford to debate whether we should or can’t pull off this monumental task. We must focus on how to achieve it – and on that front, there’s more reason for optimism than you might think. JFK didn’t have the blueprints for the Apollo landing craft in his pocket when he said: “I believe this nation should commit itself to achieving the goal, before this decade is out, of landing a man on the moon and returning him safely to the Earth.” But within a remarkably short time, we have developed the technologies that can free us from the dirty, dangerous and expensive energy sources of the past. From Australia to America, children put down their books on Friday to march for change in the first global climate strike. The event was embraced in the developing nations of India and Uganda and in the Philippines and Nepal – countries acutely impacted by climate change – as tens of thousands of schoolchildren and students in more than 100 countries went on “strike”, demanding the political elite urgently address what they say is a climate emergency.